How to convert iTunes M4V movies to Samsung Galaxy Tab 3 7.0/8.0/10.1? The third generation of Samsung Galaxy Tab includes Samsung Galaxy Tab 3 7.0, 3 8.0 and 10.1. The above three tabs share the same design language, operating system and many other parameters while differs in dimensions and weight in appearance. For watching movies, the three tabs also have high display pixels. Tab 8.1 and Tab 10.1 share the same display pixel 1280*800 while Tab 7.0 is 1024*600 px. Therefore the three tabs of Samsung Galaxy Tab 3 are very good choices for movies lovers to watch movies. iTunes is a very popular application for people to download free TV shows, purchase and rent movies, TV shows and music videos. We all know that these purchases and rentals are protected by DRM to prevent them playing in other devices except Apple devices. Therefore, what if you purchased or rented a movie or TV show on iTunes and want to play them on your Samsung Galaxy Tab 3? In this case, iTunes to Galaxy Tab 3 Converter is needed. iTunes to Samsung Galaxy Tab 3 Converter can remove DRM from purchased and rental M4V movies from iTunes and convert them to format that can be accepted by Samsung Galaxy Note Tab 3. Converting iTunes purchases and rentals is to remove DRM from these M4V movies and convert them to video formats that can be supported by Samsung Galaxy Tab 3. It is very easy to do this job with iTunes to Galaxy Tab 3 Converter. * Easy to use and complete removing DRM from M4V movies with simple clicks. Tutorial: How to convert iTunes purchased and rental movies to Samsung Galaxy Tab 3 ? Download and install the latest version of iTunes to Galaxy Tab 3 Converter. Then launch this program. iTunes will automatically open with iTunes to Galaxy Tab 3 Converter. Click Add to add movies, TV shows, purchased and others in iTunes library to the program for converting. If your M4V videos are on the disc or other location, you can also drag the M4V video to the main window of the program for converting. On the lower right of the window, choose Lossless MP4 which is the most suitable format for Samsung Galaxy Tab 3 and then adjust the Customize Profile according to your need. 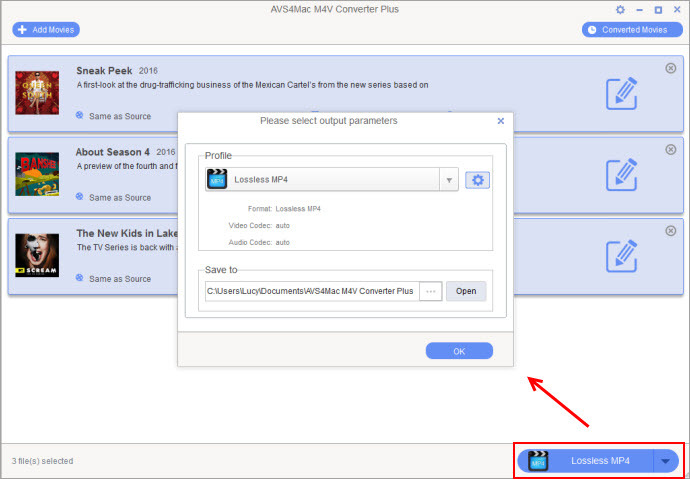 Click Convert Button on the bottom right of the interface to remove DRM from iTunes M4V video to MP4 format. Note: During converting, please do not operate iTunes in case that some errors may happen to the conversion and cause the conversion to stop. After the converting is finished, go to open the folder you saved the converted video to on the bottom right window and find the video converted from M4V. Then transfer this DRM-free mp4 video to your Samsung Galaxy Note Tab 3 for enjoying. Note: The trial version of iTunes to Galaxy Tab 3 Converter only allows one minute conversion . You can purchase the full version with only $44.95 while the original price is $49.95.